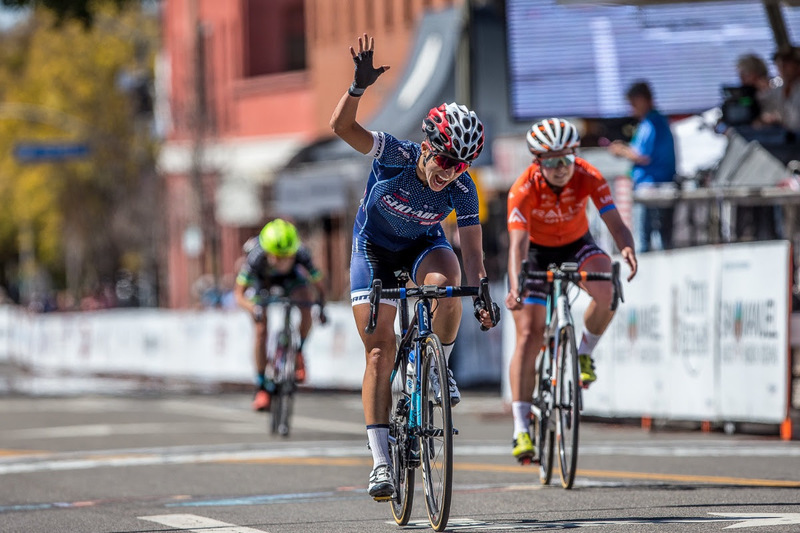 March 17, 2019 (Redlands, CA) – Erica Clevenger (Sho-Air) claimed victory on the final day of the Redlands Bicycle Classic, outsprinting Sara Poidevin (Rally UHC) in a thrilling Sunset Loop Road Race finale. Lauren Stephens (Tibco SVB) took third place after driving her two breakaway companions to the line in an attempt to claim GC. Her efforts boosted her to second overall. Amber Neben did enough to control the breakaway to secure the yellow jersey as the overall winner by 39 seconds ahead of Stephens, earning her fourth Redlands title of her career. Stephens teammate, Emily Newsom, took third place a minute back. The 68-mile race started off quietly, but after the first lap the fireworks started, with five riders gaining some distance on the pack. They included Clevenger, Poidevin, Stephens, sprint leader Lily Williams (Supermint) and Emily Marcolini (Tibco). They averaged a two-minute gap for the majority of the stage until the final climb, when Stephens pushed the pace, dispatching Williams and Marcolini. The three carried on, with Stephens sitting at the front, trying to time trial her way to a GC win. She couldn’t outpace the peloton, however, and had to be content with second overall. “Today we were all in to try and take over the leaders jersey, what I did today was part of the plan. The goal was to get Emily (Newsom) to come across but there never was the opportunity and then we were racing for. I had to put in quite a bit of time on Amber (Neben) to be able to take over the jersey so I wasn’t quite able to get that much time. Williams secured the sprint jersey, Krista Doebel-Hickok (Rally UHC) won the mountains classification and Anna Dorovskikh (Amy D Foundation) claimed best amateur jersey.